The most common scenario for big enterprise networks with multiple routers is to have a single IGP routing protocol (IGP = Interior Gateway Protocol) running between the routers in order to distribute all the routing information of the network. The most common IGP routing protocols used by today’s networks are OSPF, EIGRP (Cisco proprietary) and in some cases IS-IS. RIP also is an IGP but is not used anymore. It is found only in old legacy networks (or in lab environments for study purposes). The above situation of having a single routing protocol is the most common case. However, there are networks that use two different IGP protocols for various reasons (such as merge of two companies that use different routing protocols, migration from one protocol to another, installation of router devices from a different vendor etc). If you have two IGP routing protocols in the same network, then you must perform Routing Redistribution in order to exchange routing information between the two protocols. Note that you can configure and enable two routing protocols on a router (e.g both OSPF and EIGRP). However, this is not enough to exchange information between the two routing protocols. You must configure Redistribution as well. 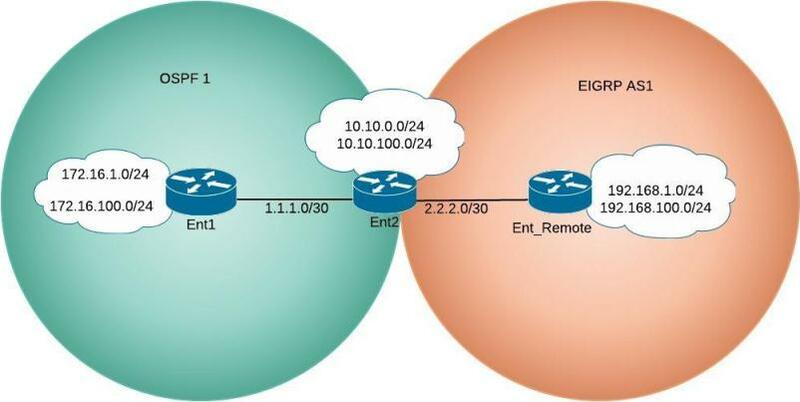 The tutorial below will focus on Routing Redistribution between OSPF and EIGRP and vice-versa. As the title says, this is an introductory tutorial in order to learn the basics of router redistribution. The network topology shown below is very basic but it will help you to expand the concepts in bigger networks. From the topology above, assume we have a remote enterprise network (RED) running EIGRP only on router “Ent_Remote”. Also, we have another enterprise network (BLUE) with two routers (ENT1 and ENT2). ENT1 is running OSPF only and ENT2 is running both OSPF and EIGRP. Our goal is to have all router devices learn all the routes from both networks. That is, we want to redistribute the routes of “Ent_Remote” into the routing table of router “ENT1” (which is running only OSPF) and vice-versa. This scenario is often seen in real life when two companies merge and they have to converge without causing downtime or modifications to the networks. Company BLUE is running OSPF and has the following networks: 10.10.0.0/24 & 10.10.100.0/24 behind router ENT2 and 172.16.1.0/24 and 172.16.100.0/24 behind ENT1. NOTE: You can find the full router configurations at the end of this tutorial. From the routing table above (before redistribution), currently there are routes for the local networks emulated by loopbacks 1&100 and also two routes learned via OSPF for the networks behind ENT2. (The blue color routes above denoted by “O” are learned via OSPF). This router is the junction between the two networks and runs both OSPF and EIGRP. Therefore, its routing table contains the routes from both networks. However, we have not configured Redistribution yet. The blue color routes denoted by “O” are learned via OSPF (from the BLUE network) and are received from the neighbor router ENT1. The red color routes denoted by “D” are learned via EIGRP and are received from the RED network (from “Ent_Remote”). The ENT_Remote device above has only EIGRP routes received from ENT2. Our goal is to have a full converged network and every router needs to learn the routes to all the other networks. To achieve this, redistribution must be performed on ENT2 router that runs both protocols. 1) OPTION1: Specify default metric for all the routes and issue redistribution command. All the routes that are redistributed will have that default metric. bandwidth to 1000 (Kbps), the delay to 33(tens-of-microseconds, or 330 microseconds), reliability to 255 (a value between 1–255 ,255 is best), load to 1 (a value between 1–255, 1 is best), and MTU of 1500. D EX (EIGRP external) as shown below. Basic redistribution into OSPF is pretty simple, just remember the word subnets because if you issue the redistribution command without the subnets statement you will only redistribute classful routes. Again the redistribution must be done on ENT2 router that has both protocols. ENT1#ping 192.168.1.1Type escape sequence to abort. Success rate is 100 percent (5/5), round-trip min/avg/max = 1/1/4 msENT1#traceroute 192.168.1.1Type escape sequence to abort.